A new set of comics to either read or avoid altogether! Each time I highlight a group of comics that are somewhat/somehow related. Even if the connection is very, very thin – I make it work! This volume has two story arcs that span a few titles. Daredevil is dealing with the apparent death of the Kingpin (spoiler – he’s totally not dead) – the major problem now being that there are groups looking to lead the crime organizations that were under Kingpin’s umbrella. 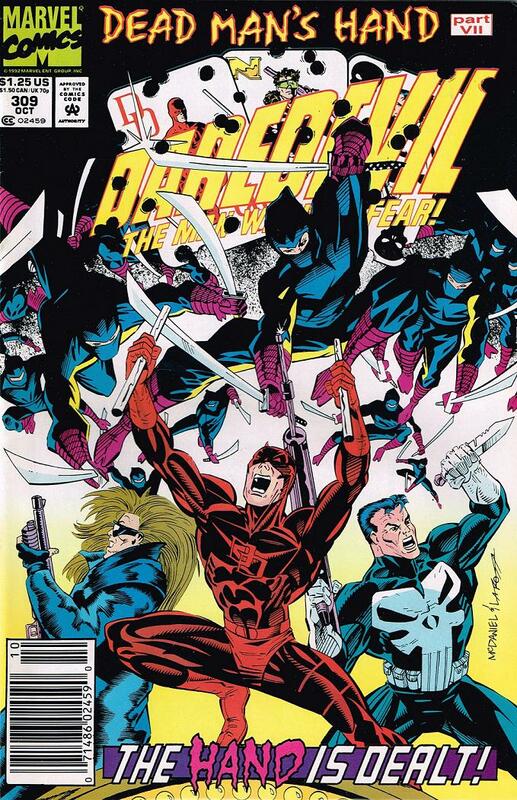 We begin in Daredevil #307 and follow the exploits through Nomad 4-6 and Punisher: War Journal 45-47. Careful though, the run has somewhat of a hiccup as Nomad #4 is Part 2 and then Nomad #5 is Part 4 – skipping Daredevil’s turn in the rotation. It’s odd – but not a big deal. Anyways, the entire series has Nomad, Castle and Murdock all on their own and getting in each other’s way. Each of the heroes are in Vegas for their own reasons. Frank heard about the meeting of the (criminal)minds and sees it as an opportunity to take out a whole bunch of bad guys at once. 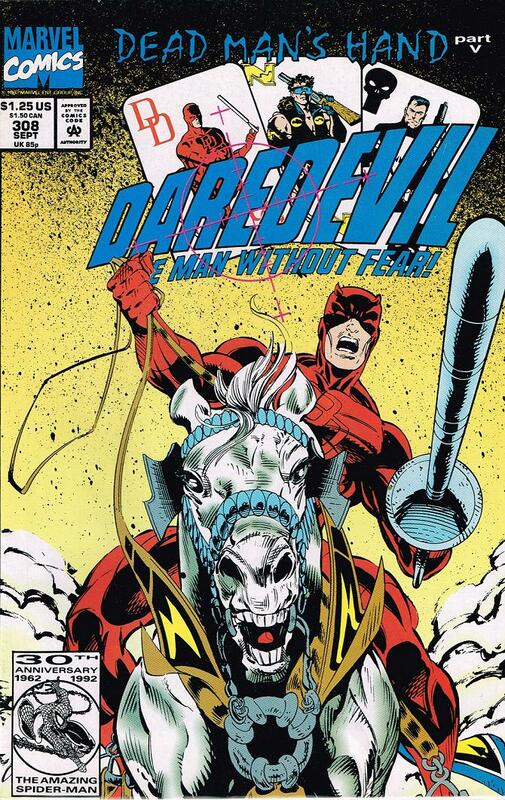 Daredevil isn’t looking for carnage but is looking to see that no one passes the torch and builds up what Kingpin’s (apparent) death has torn down. Nomad sort of just happened to be there trying to save his friend. It’s a classic “wrong place, wrong time” scenario. There is a lot of filler in these issues to make this story line run the whole 9 issues. 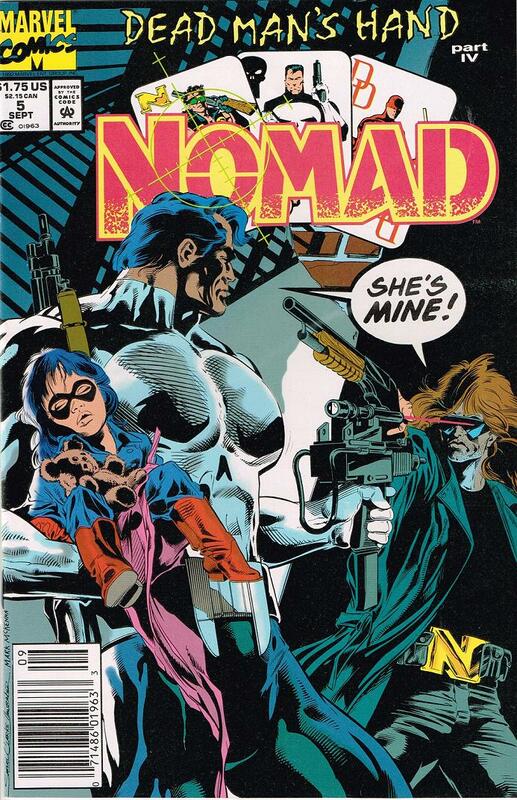 A lot of the Nomad interactions don’t really seem to add anything to the plot and of course him having a child in tow makes it even more cringe-worthy. This, mind you, was my first introduction to the character Deadpool. You read that right – when I first read this I had never even heard about Deadpool before. 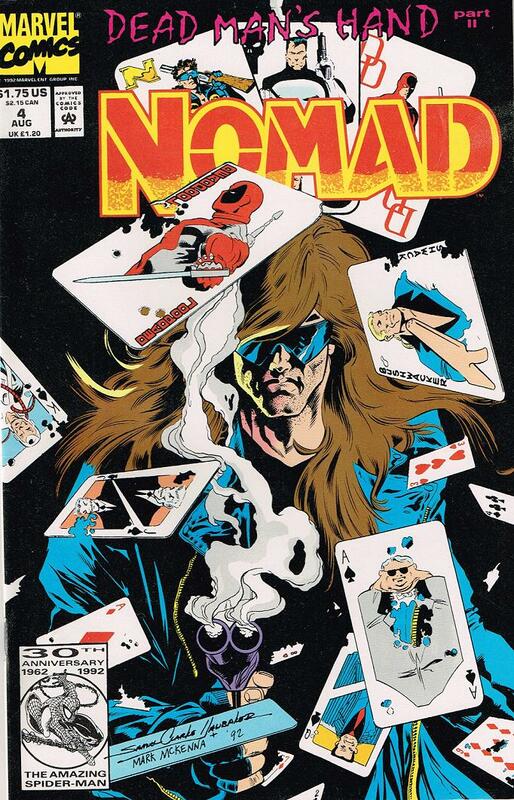 His appearance makes no sense and is of no consequence to the whole of the story – but does affect the Nomad section. 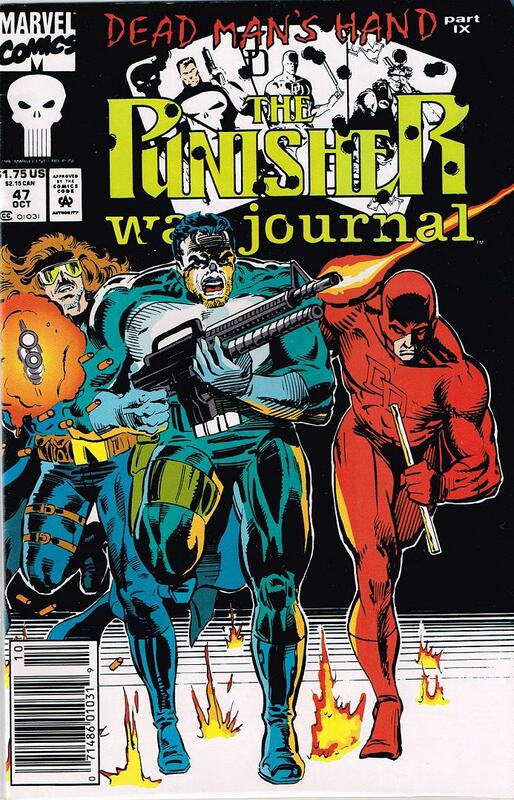 The Punisher and Daredevil are perfectly combined here with Frank’s enthusiasm to kill and Daredevil’s resolve to not let it happen. It’s the Odd Couple on steroids and a whole bunch of guns. With a stronger story base the two characters may be able to pull off a better, more entertaining tale. They are certainly the best parts of this stagnant mini but overall they can’t even save my attention from boredom. This mini is so much better for a few reasons. Mostly because you’re looking for just 4 different issues rather than 9 – and they are Annuals so you just don’t get the part of the story of the mini but extras in each! My personal favorite is The Hulk’s extra stories, of course, but the Silver Surfer’s extras come in a close second. 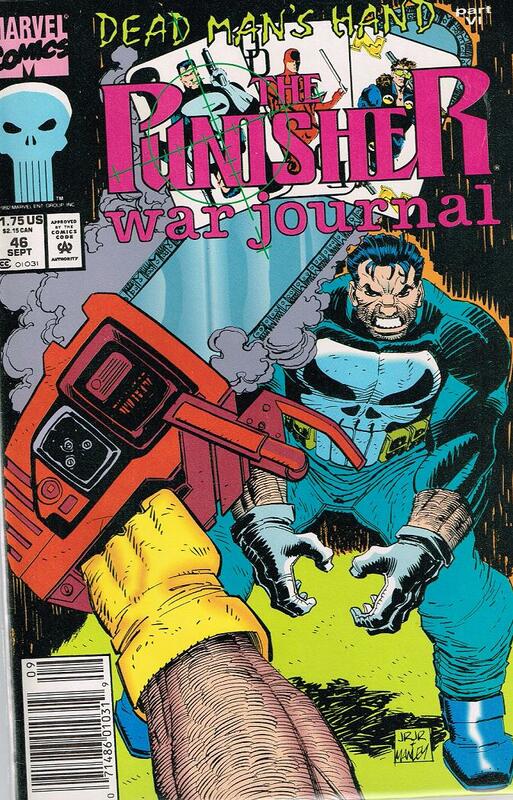 Each issue’s added stories is really fun to see – you get into Frank Castle’s arsenal and Daredevil yelling at some children. The story is a fun, gruesome and violent ride about a man who let the desire to please his father take over his better common sense. A decision that eventually costs him his life. Of course, dealing with AIM you know that you’re life may be at stake. 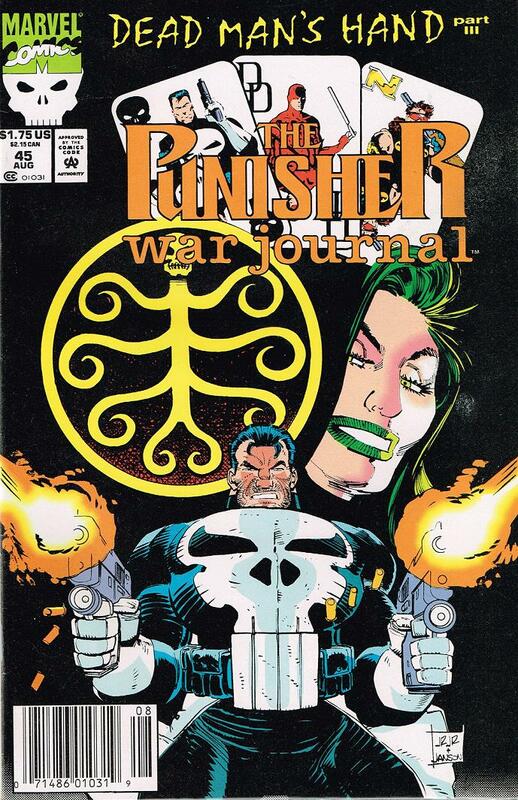 This story begins with the Punisher dealing with a wealthy family who is stuck a little too deep into there dark dealings. The choices they make ultimately costs most of their lives. 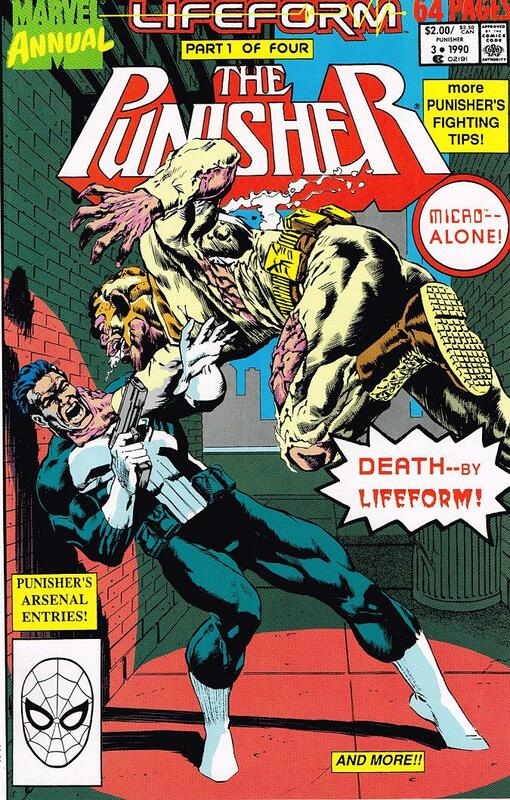 The Punisher, thinking he has dealt with the problem in his own special way, actually lets loose the creature that lurks into Daredevil. 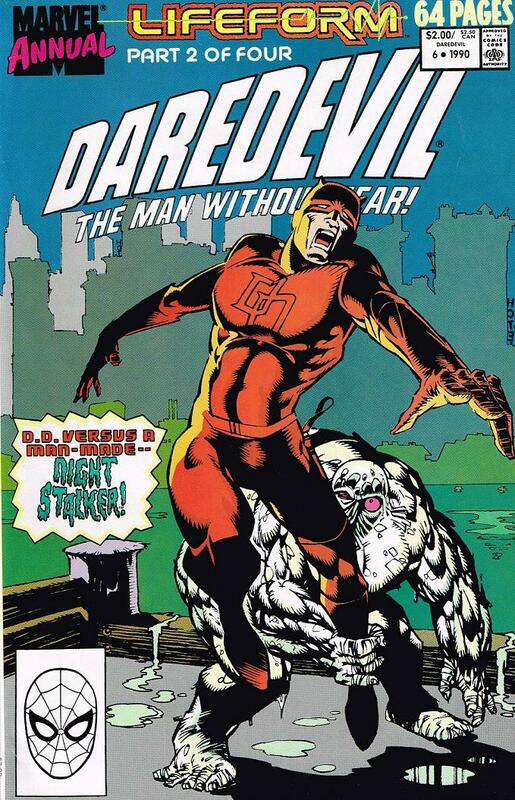 What could possibly be the only real filler issue of this 4 part mini – a sort of waste where nothing of consequence happens – Daredevil deals with the monster in a different way. You sort of can’t blame Matt for thinking that this problem ends with him. 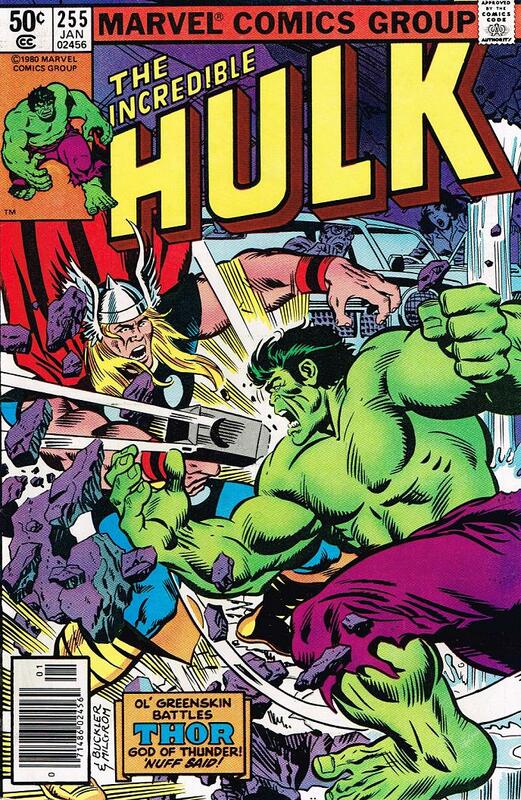 It does not though as it seeps into the pages of the Incredible Hulk. This it the most action packed issue and my personal favorite. 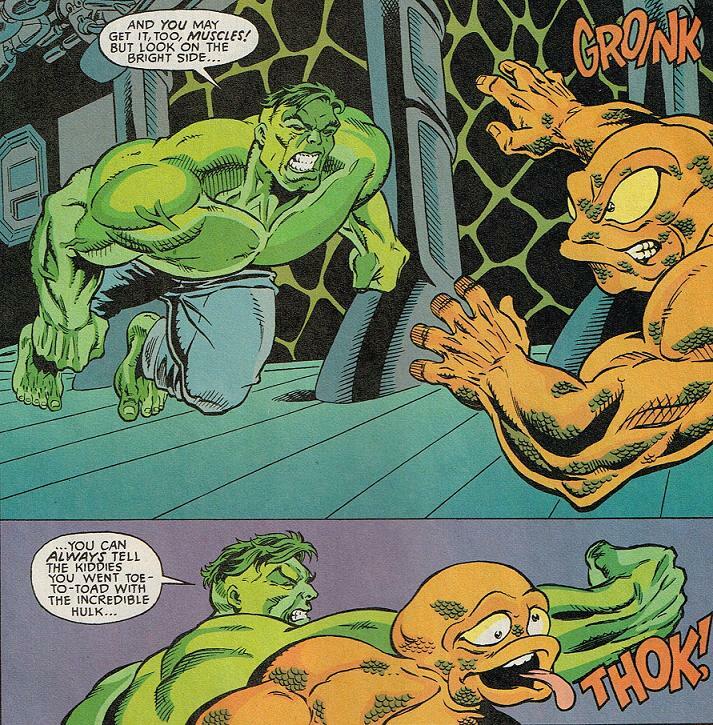 It involves a unassuming Hulk villain that I was sort of shocked to see – Mercy. As it turns out, this man who was infected with the biological weapon isn’t having any fun. The monster he is becoming continuously more and more dominant and the man inside is begging to be killed. 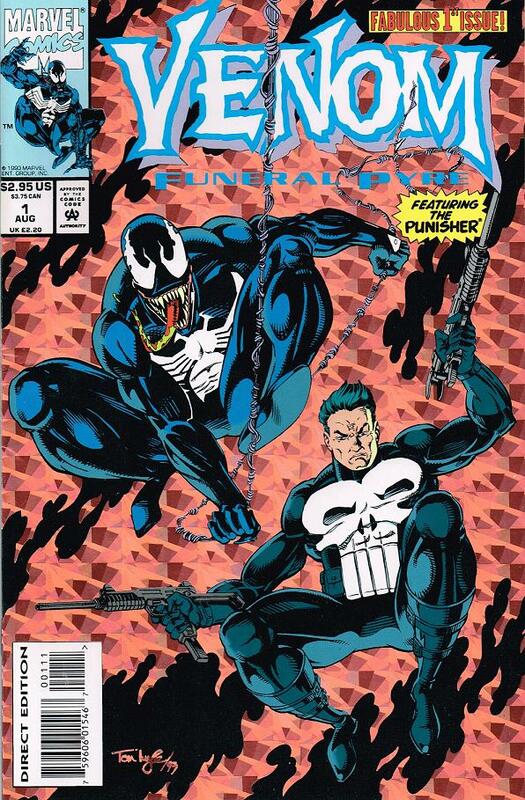 Earlier in the year I highlighted “Spirits of Venom” an absolute blast of a Spirits of Vengeance/Web of Spider-Man crossover event that used every character, including Ghost Rider, Blaze, Spider-Man, Venom, Hobgoblin, DemoGoblin and the Doppleganger, to absolute perfection. Mackie weaved an amazingly fun, hilarious and exciting story about the two world colliding as Ghost Rider and Blaze trying to stop the reincarnation of Deathwatch run into Venom and ultimately their paths cross with Spider-Man trying to protect/turn in Hobgoblin. This event was so much fun that I decided to collect the rest of the series and make my way through it seeing if the entire run was as entertaining as this 4 issue mini. 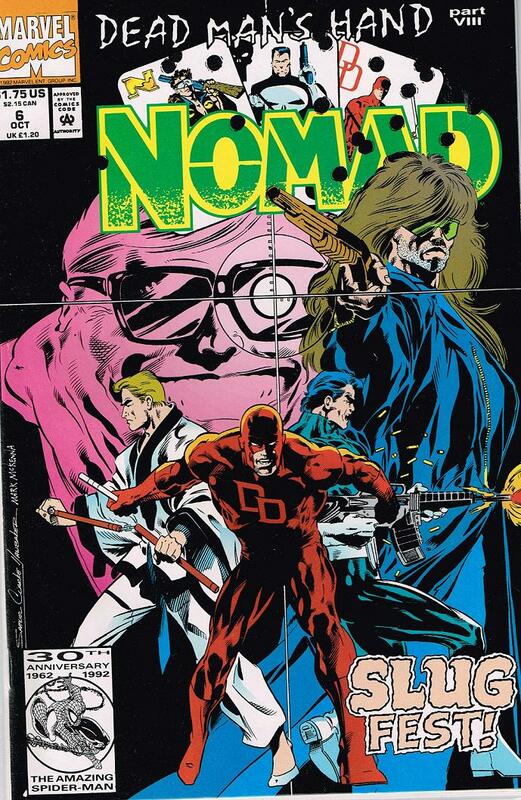 The first thing to note is that this series was just part of the Midnight Sons line of the Marvel Universe that included Ghost Rider, Spirits of Vengeance, Morbius, Night Stalkers, Darkhold and even some issues of Dr. Strange. Trying to read Spirits of Vengeance without reading the other titles is like an exercise in futility. You just read small parts of a story that continues, and most of the time ends, in a different series – so you have NO idea what the hell is going on. Something that Marvel was very aware of and used to pump up the whole line. Unfortunately, this was a failed experiment as the most people read just the titles they want to read and don’t like being forced to have to buy extra books just to understand what’s going on in their series. Case in point, I have come across Spirits of Vengeance #1 more times than I can count – and issue #23 (the last) I have seen exactly 3 times. That counts the one I own. 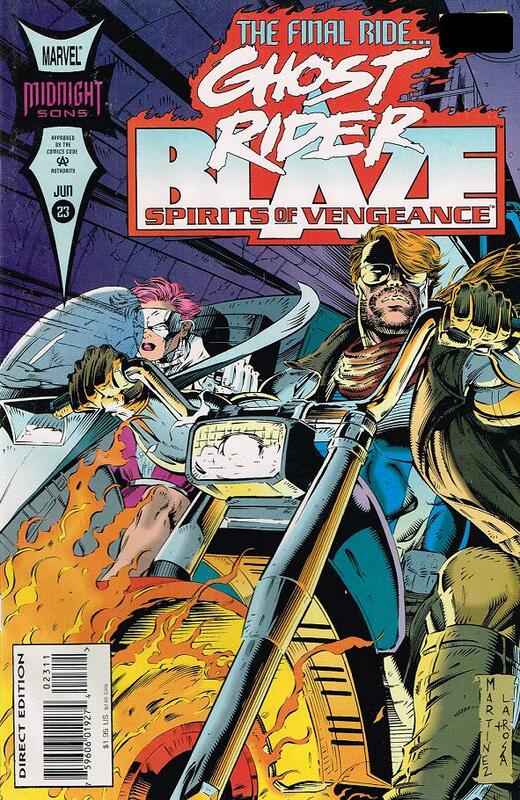 I can remember more than one instance of reading a story line where Ghost Rider and Blaze were taking on a big bad only to have the story complete in another series and the boys were off to the next adventure in the following issue – leaving me scratching my head on what the hell just happened. Because here’s the rub – I don’t want to read Nightstalkers, or Morbius. I have no interest in Darkhold or even Dr. Strange. 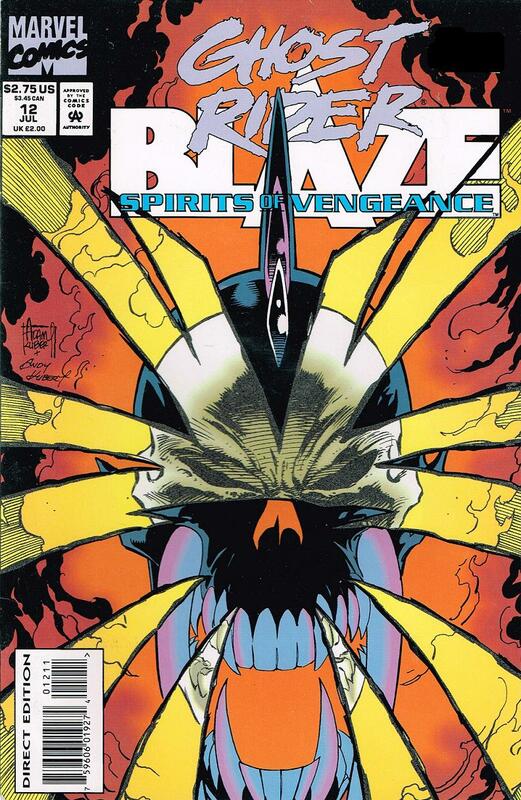 I just wanted to read Ghost Rider and Blaze’s adventures in the pages of their own comic. The other thing to note is how hard the whole run is to find. In a recent post I expressed frustration with how reboots and relaunches sort of punish the loyal readers and how I loved the good old days of straight numbering. Marvel has pretty much destroyed their numbering system and to make heads or tails of it you need a doctorate in Marvel Continuity. I think most readers are just as much to blame as Marvel though as #1’s sell through the roof and the last issues of a series are actually more valuable than most of the series as they are rarer and harder to find due to low print runs. Now, it’s not all bad news for this series – in fact, the original 11 issues or so are really fun and entertaining with fantastic art provided by Adam Kubert. The art from there on out can be hit or REALLY miss. 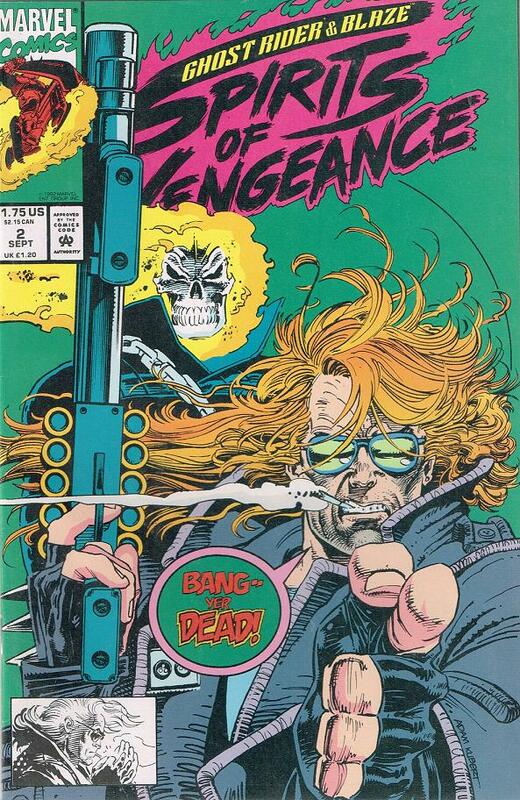 Kubert, before his departure, did create what I consider the ultimate 90’s character, Vengeance! his look was Ghost Rider – just more Ghost Ridery. Spikes? Yup – but bigger. Did I say bigger? I mean – bigger than what could be reasonably expected to actually work! Flaming head? Yup – with SHARPER TEETH! And blacker! Yup – a black skull! This was 90’s exaggeration spewed all over your eyeballs! 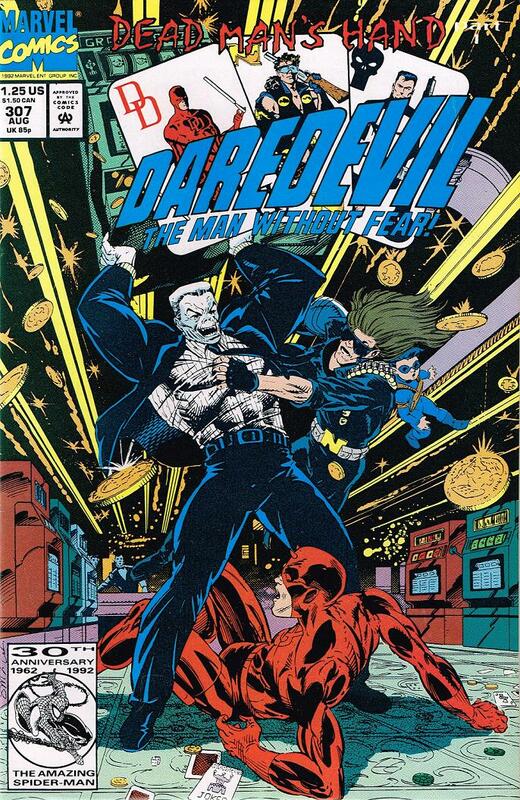 The other way Marvel went in the 90’s was to release shorter mini-series that continued the stories told previous. It was a brilliant move as they could decide to eliminate the upcoming series if the sales weren’t there or keep them going is people keep buying. Fortunately, for them – and us – they continued. After the events of Amazing Spider-Man #375 where Venom and Spidey spark a truce and Eddie Brock head to San Francisco and start a new. 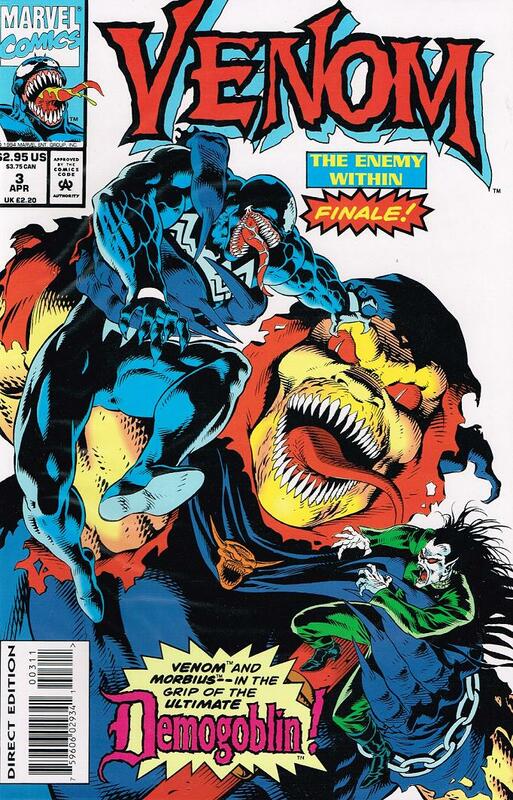 He is pursed by Spidey for the first mini titled Lethal Protector but also, Eddie becomes acquainted with an underground society of homeless people (who technically aren’t homeless) and tried to protect them from an evil mogul. The guy also took bits of Venom and made an army of little Venomites – who were pretty easily beaten. 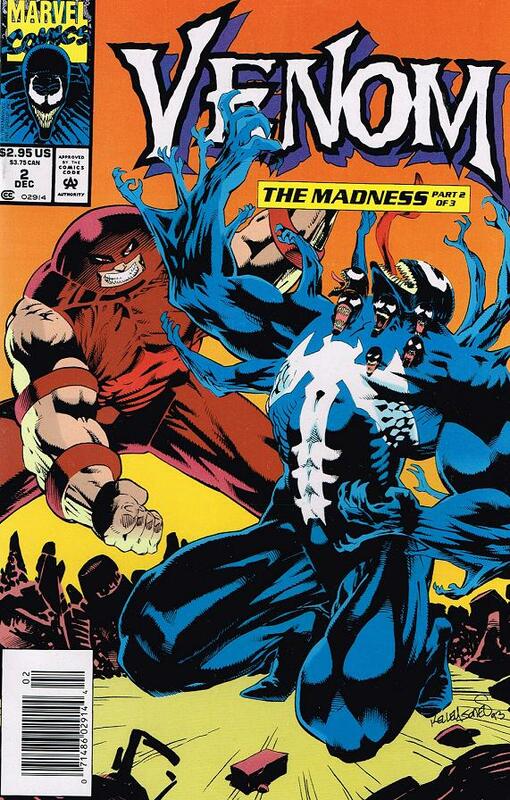 Then, The symbiote inflicted ex-reporter crosses paths with The Punisher in The Purge, gets poisoned and battles the Juggernaut in The Madness – also meets up with Hobgoblin and Morbious in The Enemy Within. Each mini-series has something really worthy of reading. 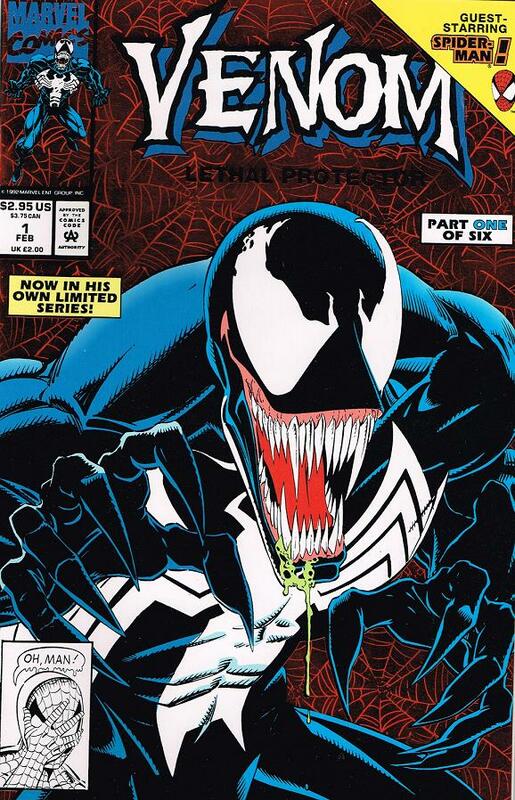 My personal favorite is The Madness showcasing Venom with the snaked out tiny Venom heads coming off the costume. This was a brilliant move by Marvel. 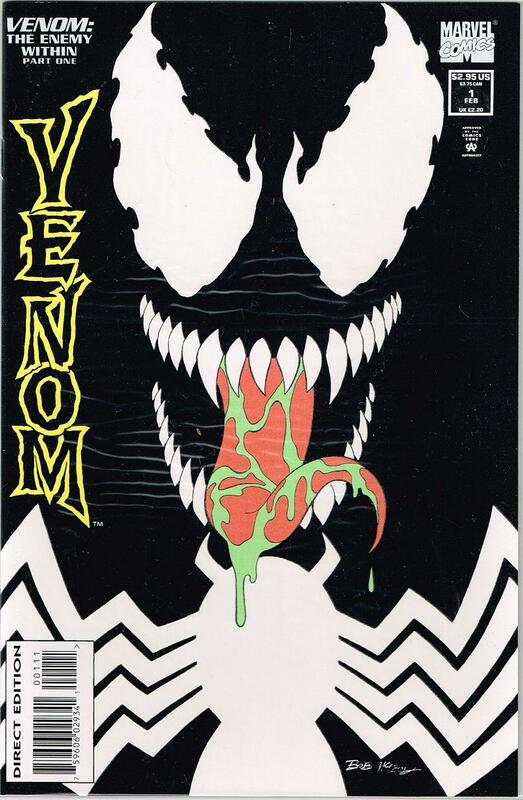 Instead of making a whole new series that they might cancel in a few years they continued to release 3 issue story arcs that showed off a new Venom adventure. If readers lost interest they didn’t have to cancel a whole series – AND, to boot, even easier to read! Back issue bins are filled with these minis that, most of them, are easy to find a complete run for every series! That’s sort of a big deal only because you don’t have to search everywhere for that rare final issue! So, if you’re looking to spend a bit of money on some 90’s comicy goodness check out these great stories. If you think there is nothing new worth reading of our favorite jade mass of muscles then read on! Basically I am going to highlight two books – One you should totally read – like, right now, and the other is one to avoid like the plague! Let’s get started! The story idea itself sounds like a great idea – and it intrigued me since I am knee deep reading the 3rd volume of the Silver Surfer (a review will be coming of this entire series). Unfortunately, they did not deliver what could have been an amazing battle. Instead the Earth is destroyed, the ultimate nullifier is incinerated, and Galactus makes Reed Richards look like a complete wuss. But hey, they lived – so happy ending, right? Ugh. Not to mention, Doom kills the Surfer (or Surfer kills Doom) and they are both no more. 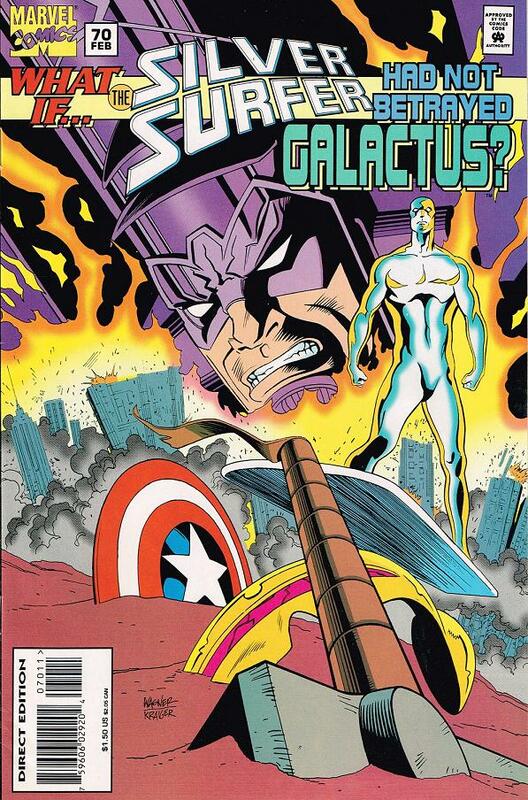 I was thinking the story would show off an epic battle between all of the heroes on Earth and Galactus withe the end result of Galactus still being beaten – but instead the Surfer betrays the FF and hands over the one thing Galactus feared to his master. The Ultimate Nullifier. With that in Galactus’ hands he wastes no time in turning the Earth into rubble. All but the FF who stow away in a storm cellar of sorts inside the Baxter Building. After that the FF tear after Galactus, bent on revenge. Doom somehow survives the event as well and wants the power that Galactus displayed for himself. He tries to catch up to Big G’s ship but runs into Surfer instead. 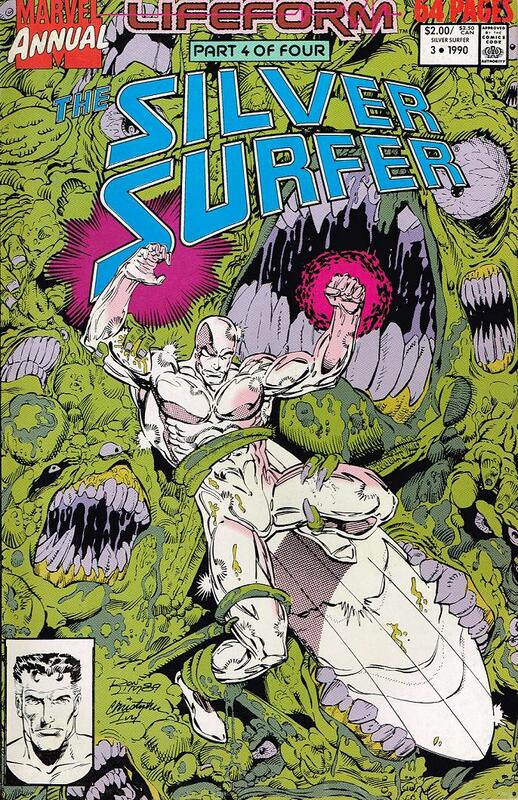 The two battle it out and, surprisingly, Doom overloads Surfer with power, and blows the Surfer up – killing them both. Meanwhile, Reed – who takes the Nullifier back – shows his hand holding nothing as he can’t even bring himself to use it. Instead, he says that he and the rest of the team will be his new heralds finding non-populated worlds for him to consume. The month before Hulk kills Wolverine the What If? series hands us one of the best What If? stories in the whole run! 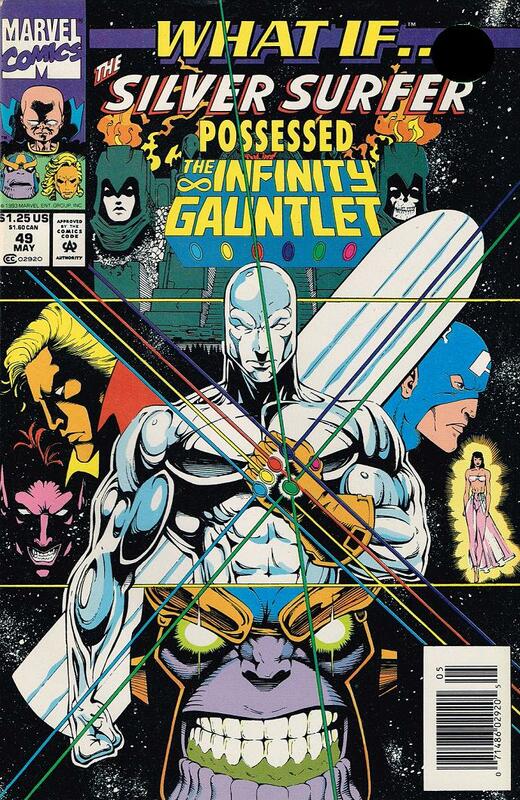 One that I am still bummed they omitted from the Infinity Gauntlet Omnibus. This is certainly an issue that would have fit in nicely! The story begins with the Surfer tearing toward Thanos (who is about to dispatch Cap) and instead of missing taking the Gauntlet off of Thanos’ hand – he snatches right off. Warlock congratulates the Surfer on a job well done but then asks for the gauntlet. Surfer, having no intention on filling that request puts the golden glove on himself. 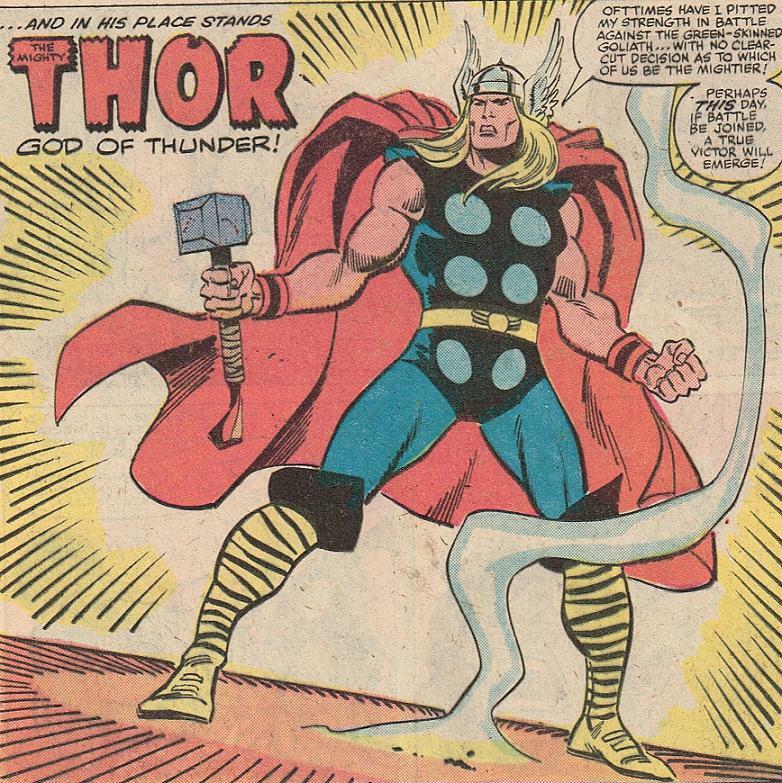 He reverts the world back to normal and undoes all of Thanos evil-doing. 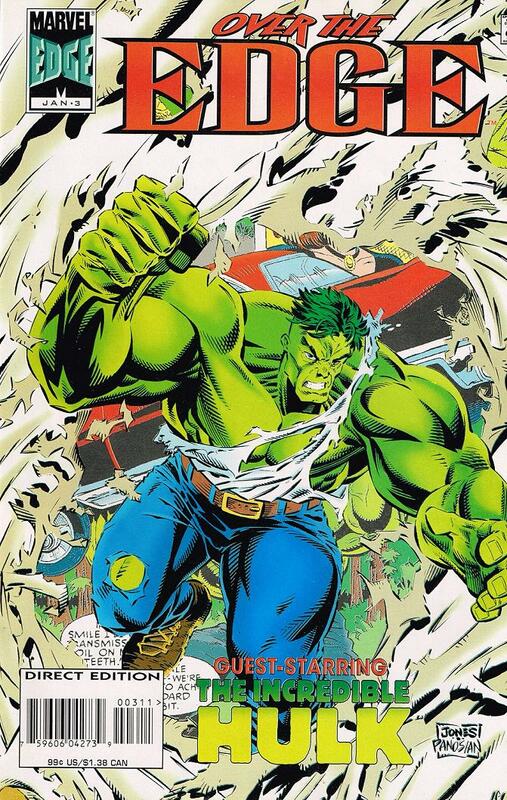 Here’s something I meant to get into a while ago – especially when Aaron was writing the Hulk into the ground and there was nothing new worth reading of our favorite jade mass of muscles! Basically I am going to highlight two books – One you should totally read – like, right now, and the other is one to avoid like the plague! Let’s get started! 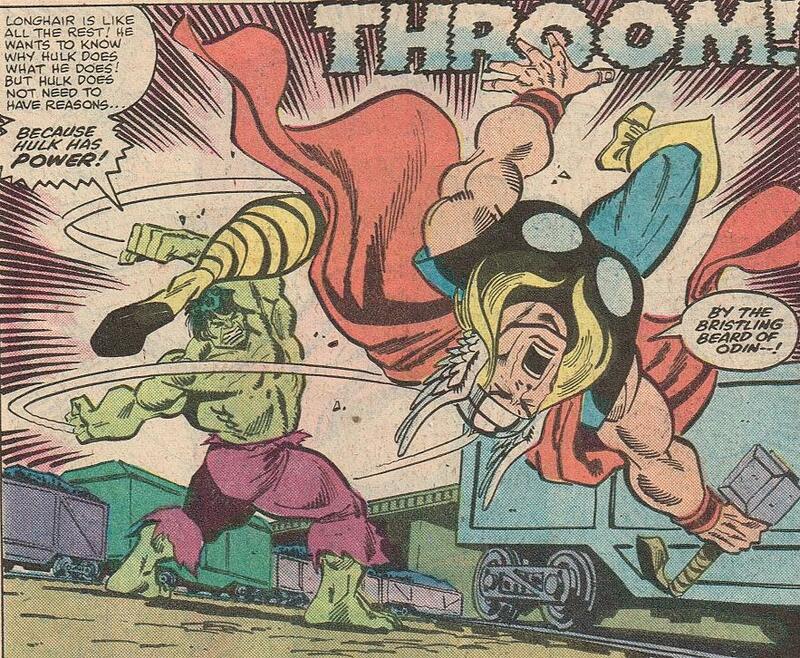 Anyone who knows me knows that I am all about silver-age Hulk characters! 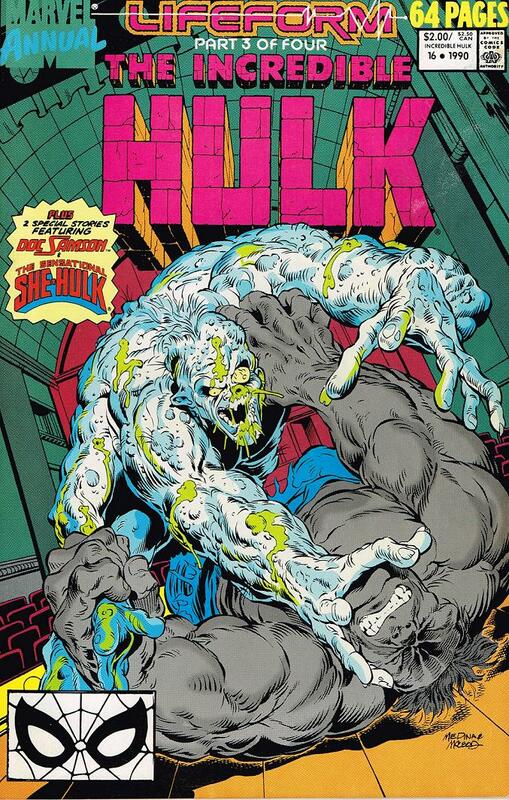 I loves the ingenuity and imagination of them all – so one would think that seeing the villains who graced the 2nd issue ever of the Incredible Hulk series would make me jump for joy – but they would be dead wrong. Especially when they are written this way. This issue reminds me of the Ron Howard epic “Cocoon”. That feel good movie where old people willingly go live on another planet full of beings who glow and make it with each other by shooting light from their bodies. Except, in this version, pretend Arnold Schwarzenegger comes in at the end and beats the aliens to hell and forces Wilfred Brimley to stay here on Earth to make diabetes commercials for the rest of his days.